Sifting through some old photographs, I found one of a machine gun pill box that I had as a young boy had many adventures in. 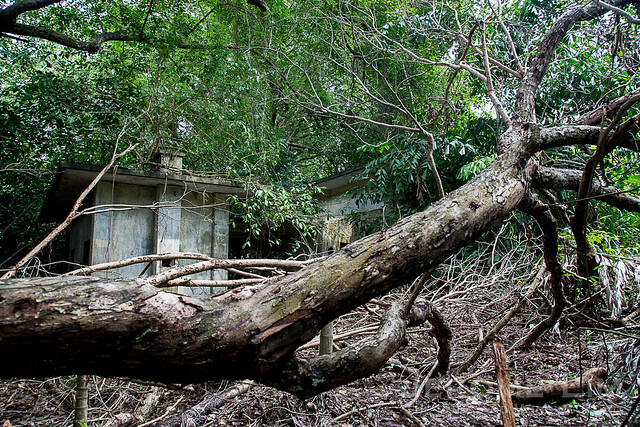 The pill box, was one of many that were scattered along the southern coastline of Singapore and one that has all but disappeared (save for the one at Labrador Park) from the southern shores – most having been demolished in the early part of the 1970s. The particular pillbox that is the subject of the photograph, was one that was located close to the fishing village of Mata Ikan, in the days before land reclamation work commenced which added the extension to our southern shores which provided part of the land on which Changi Airport is built on. The Pill Box at Mata Ikan in 1970. Mata Ikan, of which I have mentioned in previous posts on the holiday bungalows my family used to frequent, and also in a post on Somapah Village which I always saw as a gateway to Mata Ikan, was for a while a playground for me, having spent many holidays by the sea in and around the area. It was where I first used a fishing rod – a simple bamboo one with a fixed length of line and a hook at its end, fishing for catfish by tghe stream which ran to the west of the holiday bungalows. What the photograph of the pill box evokes is a few memories I have of playing in the pill box with friends, pretending to be soldiers with a piece of drift wood picked up from the beach serving as a rifle, peeping out towards the sea through the openings at the front. There is also that memory of the stench one got from the pillboxes, the stench that probably came from the litter that lay rotting on the ground within the pill boxes. It is a stench I will never forget, but one that brings with it the memories of my adventures in another lost part of Singapore’s past.